Living Area 4700 Sq. ft.
By far and away the most spectacular townhome ever offered for sale in the highly sought after age- qualified luxury community Regency at Northampton. This elegant, completely upgraded, impressive Strathmere model, which is still one of Toll Brothers most popular floor plans, features a full foyer entry creating the feel and look of a single family home. Professionally decorated from top to bottom, each room is a perfect blend of color, light and space, with literally no builder grade components remaining. Gleaming hardwood floors- a blend of Oak, Cherry, and Walnut, gorgeous and plentiful custom millwork, custom cabinetry, counter tops & fixtures, are just a few items separating this home from the pack. Your foyer entry flows into the soaring two story formal living room and dining room. To the left is the entry to the glamourous Master Suite. The bedroom features an arched entry & plentiful recessed lighting, with two large walk in closets. The bath boasts an oversized shower, whirlpool tub, ceramic tile floors, custom cabinetry and fixtures. The gourmet kitchen features stainless steel appliances, plentiful cabinet space, granite counters, pantry, and breakfast area. The family room features vaulted ceiling, designer gas log fireplace with cherry mantel. Access to the maintenance free Trex deck, which offers a pleasant view, is off the family room. Nicely sized laundry room & garage entry (2 car w/painted floor) complete the first floor. An open staircase leads you upstairs, first to the loft/upper family room with custom built cherry bar and plenty of flexible space. Bedroom two has a large walk in closet & direct access to the gorgeous full bath. Generously sized Bedroom 3 and convenient storage area complete the upper level. The finished walkout lower level adds 1,500 sq. feet of incredible useable space - giant open media/entertainment areas, large office/library, mirrored wall gym, half bath. Additional amenities include 3 zone HVAC, brick paver driveway, security system, 2 Bose sound systems, 3 wall mounted TV's & more. Fabulous community center features pool, gym, clubhouse, pond; walking trail throughout. Why start from scratch with builder in other 55+ communities and wait ten months, when you can have it all and move right in, with customization this home offers that the builder cannot duplicate. Mint, move in condition and waiting for you to call it home! 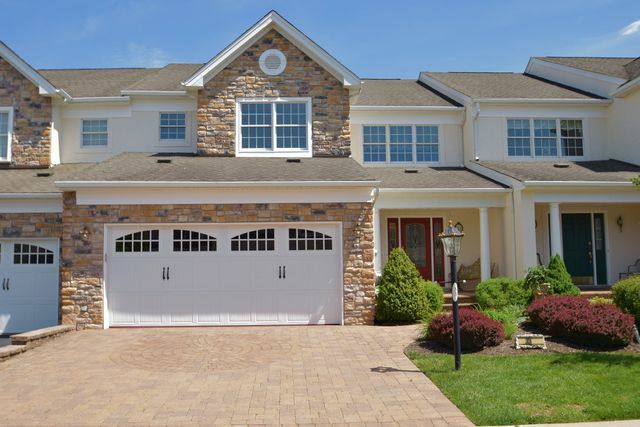 Located just one minute from Tyler State Park & 5 minutes from Newtown Boro & Richboro.